A mother takes care of her children. is a possessive or an objective pronoun. I told my teacher that it was a possessive pronoun, as the mother had ownership of her children, but she told me it was an objective pronoun as it had preceded a preposition, making it an object of the preposition. Which one should be correct, or, should both be considered? The Original Poster is correct. The word her here is a possessive pronoun in determinative function. The complement or object of the preposition of is the noun phrase her children. The head noun in the noun phrase is children and the determinative is her. This shows that the determinative in her children must be a possessive pronoun here. Note: The term object pronoun is not very helpful. It tends to imply that the pronoun needs to be the object of something to be in this case - which isn't true. Accusative case pronoun is a better term, imo. TL;DR: The word her in “A mother takes care of her children” is neither a possessive pronoun like mine nor an object pronoun like me; it is a possessive determiner like my. Give the prize to whoever comes in first without cheating. That’s a subject form not an object form, even though it immediately follows a preposition, because it’s its job in the entire clause that matters, and the object of that preposition is the entire clause. Her father takes care of her. She’d like to see some of *my. She’d like to see some of mine. For your situation, the actual possessive pronoun corresponding to the subject she is hers — not her, which is not a possessive pronoun at all, merely a determiner or object form. When Billy wanted to help Sarah with her homework, he would do hers as well as his own. As you see, several forms span multiple columns, meaning that the same spelling works for multiple functions. Furthermore, the reflexive / emphatic forms ending in self are sometimes derived from possessive determiners and other times derived from object pronouns. All this can be very confusing to learners. When you add in archaic, nonstandard, and dialectic forms, which you will nonetheless from time to time encounter, the picture becomes even more confusing. Wikipedia offers another table immediately below that one, but it is too large to reproduce here. Instead, let me flip the axes around and fill in the forms that occupy more than one position. This should make it easier to understand for some people’s learning styles, because now you have the various forms corresponding to a particular person lined up in an easy-to-read column. Note that I include only the forms you are apt to encounter in normal use. I have omitted nonstandard and dialectic forms to simplify matters, as well as the archaic second-person plural pronoun ye, which while originally a subject pronoun came to be used as an object pronoun, too. I have also omitted the most common impersonal pronoun set: one, one’s, oneself. The discussion only arises because English grammar uses the term object not only as sentence part (objects after verbs) but unfortunately also as term for word groups (object after a preposition). In my view, a use of the term object which only leads to confusion. As to me, "her" in "her children" is a possessive adjective and it is totally irrelant whether "her children" is preceded by a preposition or not. If you choose another term for the noun after a preposition, e.g. preposition complement then the discussion is pointless. In all my life I haven't found it necessary to have a special term for the noun following a preposition. According to my definition you can place a preposition before a noun to get secondary indications (where, when etc). Of course, there are cases where a preposition is followed by other word classes but in almost all these cases you can insert a noun to get the full formula. The cat appeared from under the couch ( from her place under the couch). Added: Actually I find the original question totally confusing because there are several things intermingled. 1 What word class is "her" + children? Traditionally "her" is a possessive adjective, and not a pronoun. 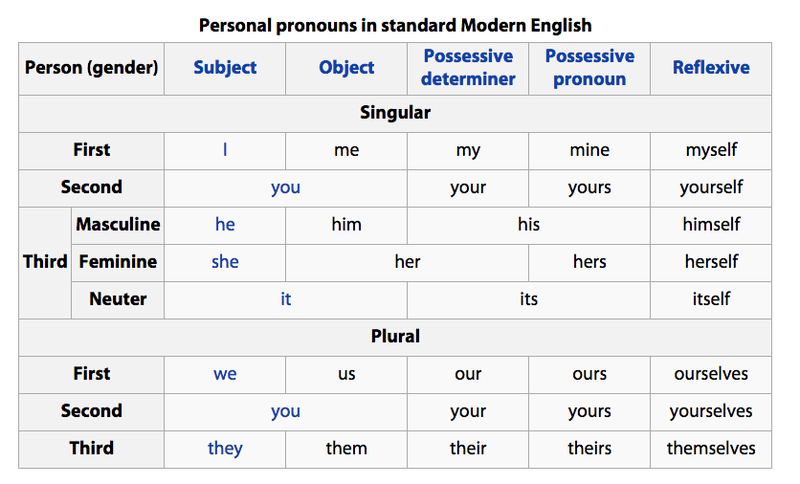 The possessive pronouns are used without noun and are mine, yours, his, hers etc. 2 What case follows after a preposition? In English there is only one answer: an accusative (direct object). In English this becomes clear only with personal pronouns: for him, to them, about us. But I think it makes no sense to ask which case is "her". You would ask: A mother takes care of whom? Answer: of her children/ of them. So the whole noun group "her children" is an accusative or object case. Subject case would not make sense. But one can't say "her" alone is in object case. For me this absurd question is a paragon to show how simple structures can be made a problem. 2 After the preposition of follows "her children", which is object case. 3 and "her" belongs to the word class possessive adjectives. As such, her is the usual possessive pronoun here. her is the object, the objective pronoun, in the oblique/ accusative case. There may be a reason why the teacher considered it otherwise, the OP could get it clarified. Not the answer you're looking for? Browse other questions tagged prepositions personal-pronouns grammatical-case possessive-pronouns possessive-determiners or ask your own question. What was the difference between “ye” and “thy”? My as an adjective, posessive pronoun, or prepositional phrase? “This looks like him” or “This looks like he”?